For almost a decade, Planting Justice has been dedicated to uplifting the Bay Area community through food and education. With a four-acre farm, nursery, and a stand at the Jack London Square Farmers Market, the grassroots organization lives its mission of empowering people affected by social inequalities and mass incarceration by cultivating food justice, environmental justice, economic justice, and social justice. Every year an estimated 650,000 people return from prison to their homes without much assistance in their re-entry, and many systemic barriers stacked against them. Arrest and conviction records often times block men and women from getting housing, education, and jobs, making it difficult for them and their families to get on their feet. With formerly incarcerated men and women making up half of their staff, Planting Justice actively fights the damaging long-term effects mass incarceration has on our community every day. As part of their mission, Planting Justice also operates a robust garden and nutrition education program in five Oakland high schools to empower students with urban gardening skills and knowledge on social justice issues, ecology, and holistic wellness. CUESA spoke with co-founder and Director of Education Haleh Zandi about Planting Justice and food as a vehicle for social change. CUESA: What brought you to your work in food systems and to founding Planting Justice? Haleh: I got into this work through my anti-war organizing.The industrial agricultural food system in the United States is dependent on fossil fuels, and I feel that’s the political, socio-economic reason why the U.S. is still in the Middle East: to control fossil fuel resources. I think it is important to use the power and influence that we have here in the Bay Area to develop a more local and sustainable food system to help shift practices in the U.S. so that we don’t have to have this exploitative, imperialistic approach toward the rest of the world. Can you tell us about the land Planting Justice operates on? We have a four-acre farm in El Sobrante and a two-acre nursery site in East Oakland. The nursery is called Rolling River Nursery, and it was a family-run business for many decades. It has about 1,100 different varieties of fruit and nut trees, including the products that we are selling at the farmers market, which are a collection of perennial fruit crops that are certified organic and super biodiverse. In addition, our nursery is shipping plants all across the country every day. When the nursery was a family business, it was volunteer-run, but based on the history of exploitation in the food system. We are committed to providing living-wage employment for our employees. Environmental justice is one of the pillars of your mission as an organization. Can you talk a bit more about your partnership with the Sogorea Te’ Land Trust and how it relates to this? 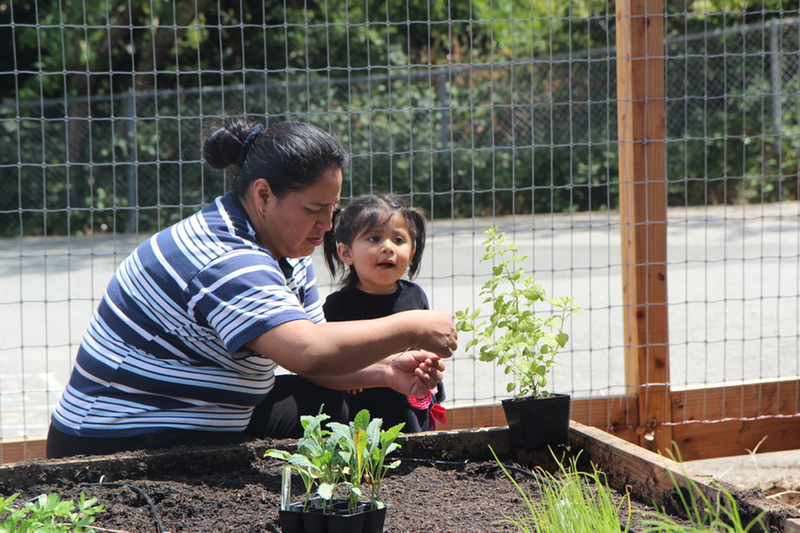 The nursery has been an incredible project, and there is where we have partnered with Sogorea Te’ Land Trust, which is run by Corrina Gould and Johnella LaRose, two indigenous women who have been working to protect sacred sites in the Bay Area. They are also working to gain access to land for ceremonial purposes. There is about a quarter-acre of the land, where our nursery is in East Oakland, where they are building an arbor. Once we pay off our loan for the land, we are going to put the whole title of the two-acre property in the Sogorea Te’ Land Trust as an agreement to continue to operate on site. That is our plan for returning the [Ohlone] land that was once stolen [to its rightful indigenous stewards]. Why are farmers markets a part of Planting Justice’s business model? One of the main reasons we wanted to get into the farmers market is because the trees, bushes, vines, and herbs that are planted out at the four-acre farm are going to be fruiting soon. We will be harvesting next year for the farmers market, and we will have produce available for distribution. How does Planting Justice help educate people about the importance of protecting our land and growing our food using sustainable practices? When you are doing urban gardening, touching the earth, and harvesting, that whole experience is very rewarding. It is also a good introduction to changing other habits that we have as Americans, such as how we get our energy and how we get our water. I think food is an easier concept for people to gather around than, say, fossil fuel energy versus solar energy, because food is so nourishing and such a community-driven practice. When I was learning about social movements, a lot of the organizing was around food, such as Gandhi’s Salt March, the Black Panther Party’s Free Breakfast Program, or the United Farm Workers’ Grape and Lettuce Boycott. If you talk to anyone about good food, you can probably agree on something; it’s a unifying model. 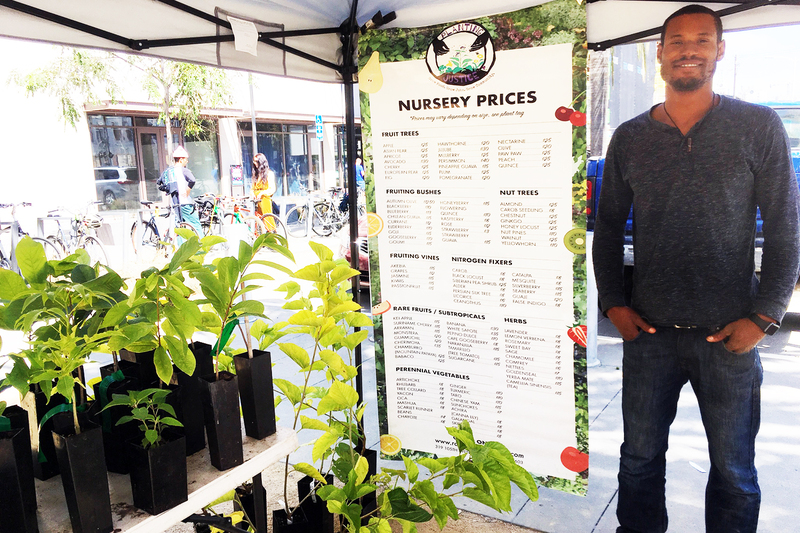 Support Planting Justice by purchasing plant starts at their stand at the Jack London Square Farmers Market on Sundays. Planting Justice employee Region Lewis at Jack London Square Farmers Market appears in the top photo by CUESA. 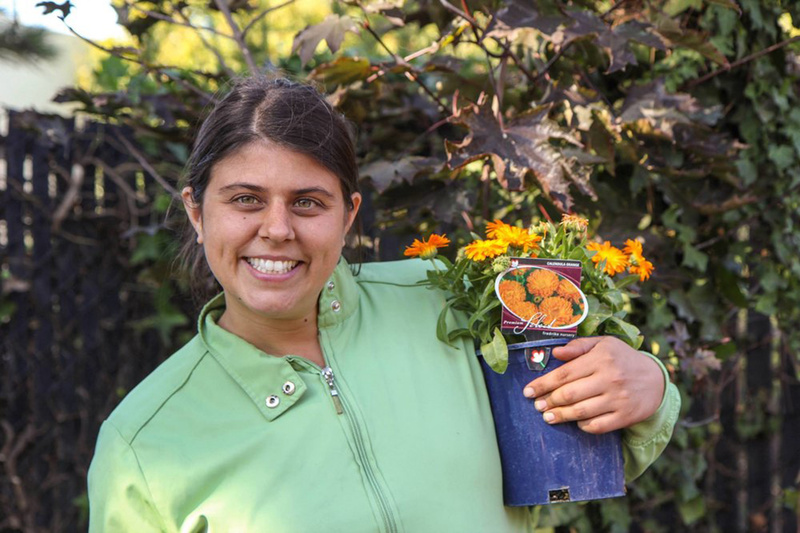 Haleh and garden photos are from Planting Justice.